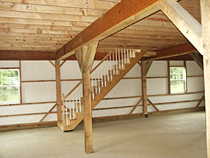 Shown here are few barn interior images to familiarize you with our custom barn construction. 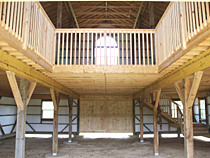 As you can see from the images shown below, we can build you a barn with finished interior, or leave it completely unfinished. 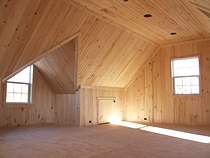 We offer different type of lofts, roof designs, dormers, small or large overhangs and many other options. 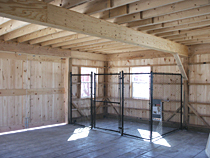 Our smaller barns, such as 24'x24' custom garages, can be built with clear-span loft supporting beam, eliminating any interior center posts. 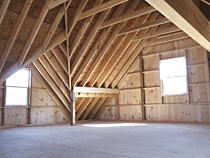 For larger barns, loft beams must be supported by posts. 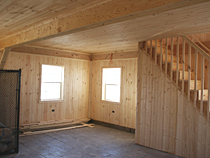 Our lofts are built with 2x10 floor joists 16" o.c. and 3/4" T&G plywood. 36" wide stairway is usually placed in one of the corners.